A fresh round of updates to the Google Photos app began rolling out this week. Aside from a few small tweaks to wording, you're probably not going to see any noticeable changes as a result of installing the latest version, but as is often the case, there are at least several topics to cover in a teardown. We can look forward to counting up Likes on our shared photos, easier sharing of Motion Stills, and of course, the wider rollout of Google Lens. Also making a return appearance is Austin's infamous mysteryer feature. Nearly two years ago, Google Photos expanded shared albums with the ability to post comments on photos. While comments are great, we live in a social networking age where a thumbs up, heart, or even a +1 conveys everything we need to say... Or maybe it's just more time efficient for everybody involved. Whatever the reason, Google Photos is preparing to follow suit with its own support for likes. It's clear from text that both photos and videos can be liked. So far, it looks like there may still be some parts of the interface missing, so this probably won't be ready to go live without another update. It's a small thing, but as we get closer to the new Favorites feature – a conveniently accessible album that you can quickly add or remove photos from – there are still little bits and pieces dropping into the mix. The latest addition is an icon that will go with it. Curiously, this icon is labeled with the same "photos_hearts_viewbinder" prefix as the Likes feature mentioned immediately above, but the word "favorite" adorns this image. There seems to be a bit of mixing and matching of metaphors. Lens originally launched on Pixel phones as an exclusive preview, but there was little doubt it would eventually hit the mainstream. Sure enough, a few days ago Google announced that Lens will become widely available to English-language users with compatible phones, and more phones and other languages are planned for the future. In the latest update, the phrasing of a few lines has been changed to reflect that this is no longer a Pixel exclusive. 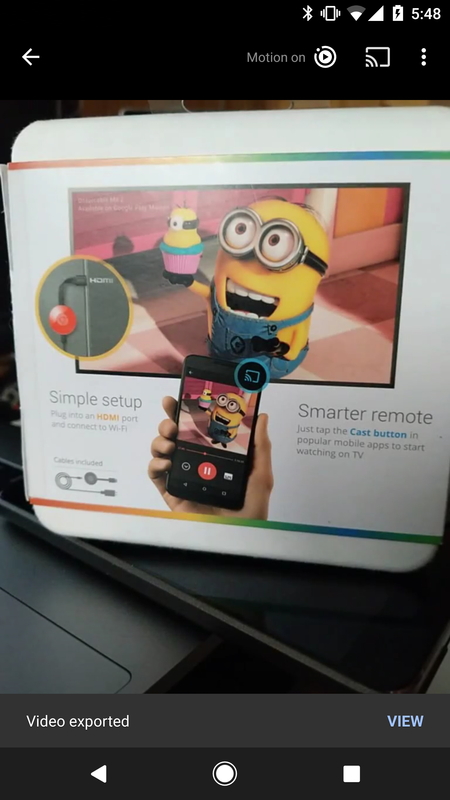 With that said, installing the latest Photos update doesn't automatically enable Lens, so we're still waiting on Google to flip the switch remotely, assuming you're using a compatible phone. 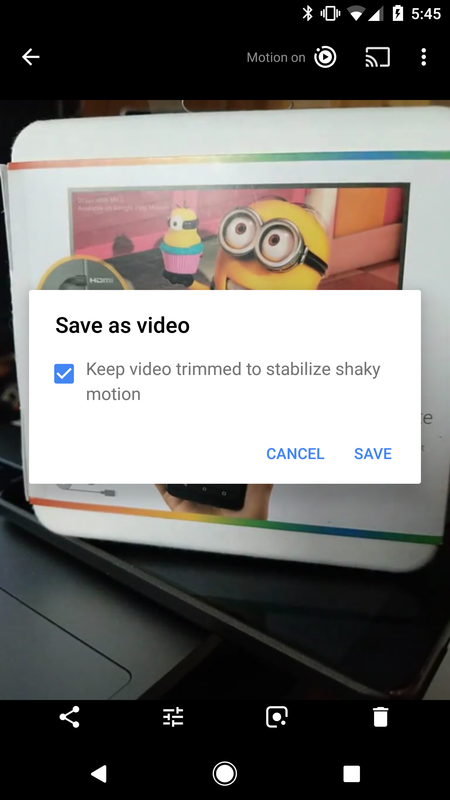 Google Photos will be gaining an enhancement that will make it easier to send out your Motion Photos in generally portable formats. To be specific, new text in the v3.15 update describes commands for exporting Motion Stills as GIFs, videos, or still photos. The names of the new strings include the word "microvideo," which belongs to the Motion Stills support added a few versions ago, so this probably won't apply to videos. This isn't a exactly a major new feature. Rather, it looks like a twist on existing support functionality. 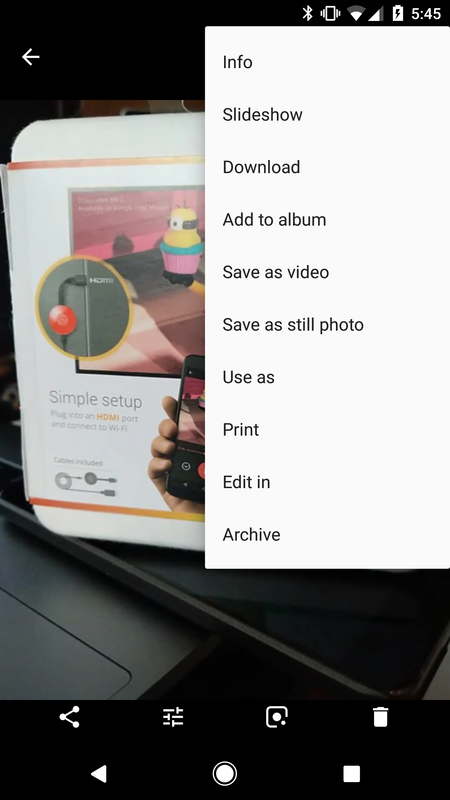 Already present in the app was a pair of commands to save Motion Photos as videos or still photos. Saving as a video would prompt users as to whether they wanted to use stabilization with a message very similar to one line of text above. Once finished, a snackbar pops up from the bottom that even says the video was exported. The end result is a video stored in Google Photos. In all likelihood, this new set of export commands will perform the same operations, but instead of creating a copy in Photos, it will probably display a share dialog so users can pick a destination for the output. The one actual differentiator is that GIF output is definitely new, though we've seen that a similar feature is also coming to Gboard in the future. Austin's communications continue to get more cryptic, but possibly more telling at the same time. It has been nearly a year since Austin began slipping notes in class. Since then, new messages have said hello, and subsequently progressed into what could be a very confusing interesting word riddle. The latest entry brings yet another change to the text. This time, we're looking at a curious mix of underscores, spaces, a few slashes, and two pairs of capital letters: AS and AP. To me, this little drawing looks like a forced perspective of a flat surface with the letters AP in the foreground and AS in the background, likely falling out of focus. This might line up with some theories that the mystery feature is an enhanced version of Google's portrait mode that allows for adjustment to the simulated bokeh (blurring effect). At the very least, I think it's still a safe bet that this is linked to depth of field. Just for fun, there are a few other potential explanations that come to mind. The simplest interpretation might just involve combining the letters, which become ASAP (short for As Soon As Possible). I don't recognize much symbolism to that, so I tend to doubt it... Unless this is Austin's clever alternative to an outright S.O.S. If that's the case, we need something just a little bit more specific. Just cough four times and swipe forward on your Google Glass three times, and we'll come right over to break you out of there, buddy! Another route is to look for terms related to the fields of photography and optics. As much as I'm inclined to presume AP is short for Android Police, it could also stand for Anamorphic Perspective, the science and practice of distorting an image and then viewing it in special circumstances to see the original image (here are some examples designed for cylindrical mirrors). Terms for the letters AS were harder to find, at least without digging deeply into mathematics. At this point, I'm curious if any of these clues will even make sense when Austin's mysteryer feature launches. Just remember, somehow there would have to be a link with both an airplane and the brand name of a water filter (or the pedantic blonde from a once-promising show on NBC).